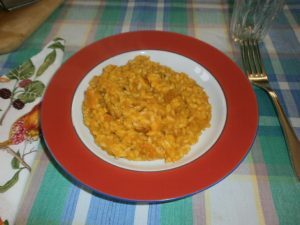 Today we made a delicious Butternut Squash Risotto. It was so good that I really want to share this with you. 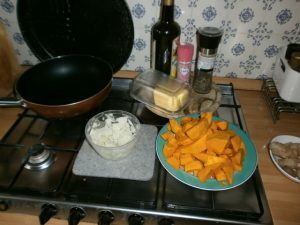 For 4 people you need: a small squash, an onion, olive oil, butter, salt, pepper, vegetal stock (or broth) parmigiano cheese, rosemary, sage and 1 coffee cup of Arborio rice per person. 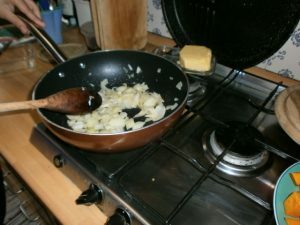 Chop the onion and fry with oil and butter until it is slightly translucent. 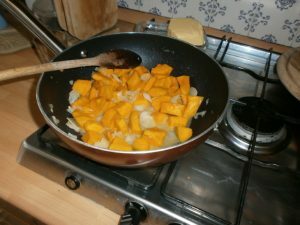 Add ½ coffee cup of white wine and the squash cut in small slices. 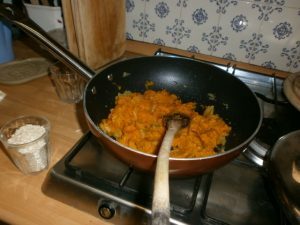 When it is tender, add the rice and cover with vegetal stock and mix with a wooden spoon . 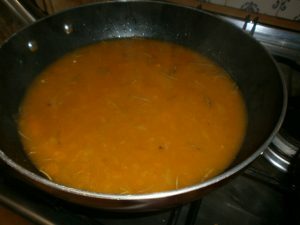 You can add vegetable stock if the rice is not cooked but be careful: add small quantities to avoid a liquid rice. Finish with a pinch of rosemary and sage. Serve with a generous part of grated Parmesan c heese.